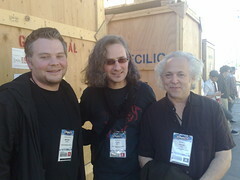 So with that in mind, here are three of my favourite interviews with guitarist David Torn. David is both a truly remarkable guitarist/composer/improvisor and a brilliant thinker about the processes around music. Clear-headed, mischievous wisdom that ties music to human-ness. He’s brilliant. The first one is in 3 video segments, embedded here. It came out at the time of his last album, and explains some of the improvisation/composition/processing that went on around its creation. Great stuff from a remarkable mind. Next up is a series of interview segments and demonstrations he did for guitarbandDVD.org - they’re all in this post here. Fate Is Not Completely Decided. Every Mind Has To Be Defused. There’s so much in each of these interviews, you could easily spend a couple of months just processing the ideas and musical processes put forward. Please feel free to comment on any quotes or ideas that particularly resonate with you.